Welsh Border Infantry Brigade Camp, 1914 – From Verna Palmer’s – A Portrait in Old Picture Postcards – the caption reads “At the beginning of the First World War, a temporary camp for soldiers of the Monmouth and Hereford brigades was set up on land alongside Gobowen Road, opposite the railway works, whose roof has been used for the caption in the foreground. Camps similar to this one sprang up all over the country as temporary accommodation for the large influx of recruits who signed on at the onset of the war, before they were sent to more permanent camps in this country or battlegrounds abroad. 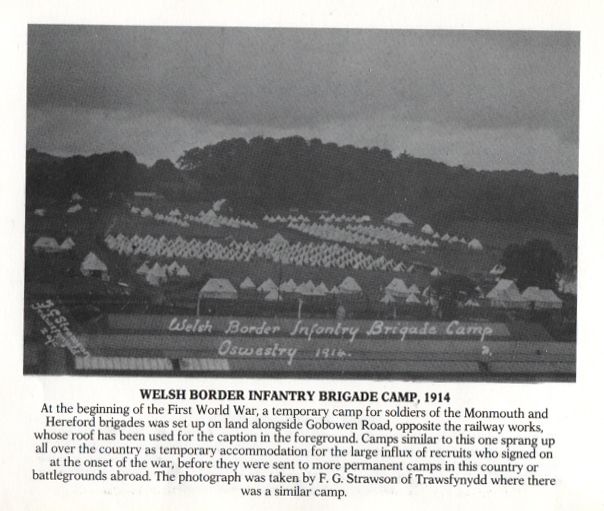 The photograph was taken by F G Strawson of Trawsfynydd where there was a similar camp.